To illustrate this I’ve compiled the following animated GIF. The camera was mounted on the tripod, all camera settings remained the same. I made 9 images in total taken at intervals of between 30 and 45 seconds, so the sequence covers roughly 5 minutes. The point is that I wasn’t really aware of how much the lighting of the scene was varying until I reviewed the second image on the back of the camera. Flicking between the first and second images in the series indicated a dramatic change. It was only then that I observed the scene more intently and became acutely aware of the changes that were occurring. We all like to think we understand and appreciate the quality of light we are working with but it’s worth taking the time to really look and study the scene intently. It’s also worth taking multiple shots like this. 9 images, identical composition but 9 very different results! 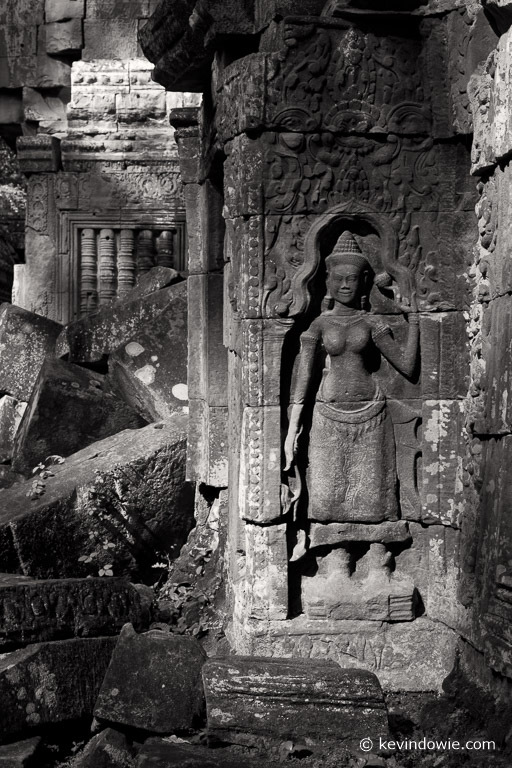 Apsara, Ta Phrom in monochrome.